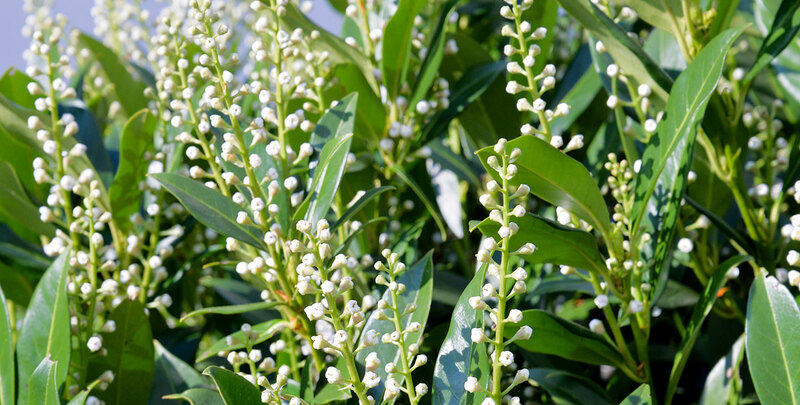 Cherry laurel ‘Genolia’® is an evergreen shrub that is characterised by the gorgeous appearance of its dark green, glossy leaves and its exceptionally narrow, compact and dense growth habit, the latter being a result of its ascending branches. Due to these qualities, this cherry laurel cultivar is an excellent choice if you would like to grow an evergreen hedge that will ensure year-round privacy, but also like the lively, playful character that is generally associated with deciduous hedging plants. While most plants with such large, elegant leaves require a certain amount of space, cherry laurel ‘Genolia’® is very unlikely to exceed a width of about 90 centimetres and is a great choice even if your garden is relatively small. Cherry laurel ‘Genolia®’ is not only a beautiful plant, it is also a very tough hedging species that will do well in just about any soil. As long as you plant your cherry laurel ‘Genolia’® hedge in a soil that is not too wet or chalky, it will liven up your garden, even if planted in a shady position. This cherry laurel variety will reach an ultimate height of about 3.50 metres at an average annual growth rate of 40 to 60 centimetres. Despite this relatively fast growth rate, you only need to prune this cultivar once a year, preferably during the autumn. Be careful not to cut into its beautiful leaves when you do. In the unlikely case that it becomes overgrown, it is possible to cut your cherry laurel ‘Genolia’® hedge back to about 40 centimetres above the ground. While cherry laurel ‘Genolia’® is not too picky about the soil type it is planted on, it does generally not like chalky soils. Like most cherry laurel or prunus laurocerasus varieties, it performs admirably even in the coldest winter temperatures. This very hardy cherry laurel cultivar guarantees that its stunning leaves will decorate your garden even when the temperatures drop below zero and snow is no problem for cherry laurel ‘Genolia’®. This sturdy evergreen will be beautiful during all four seasons, holding on to its leaves during the winter and having the additional seasonal interest of flowers during late spring and red to black berries in the autumn. Keep in mind that these berries, as well as the leaves of the cherry laurel, are highly poisonous to humans. Cherry laurel is one of the most beloved evergreen hedge plants and anyone who has ever seen a cherry laurel hedge will probably understand why. The plants are elegant and the leaves add a gorgeous sheen to any garden. 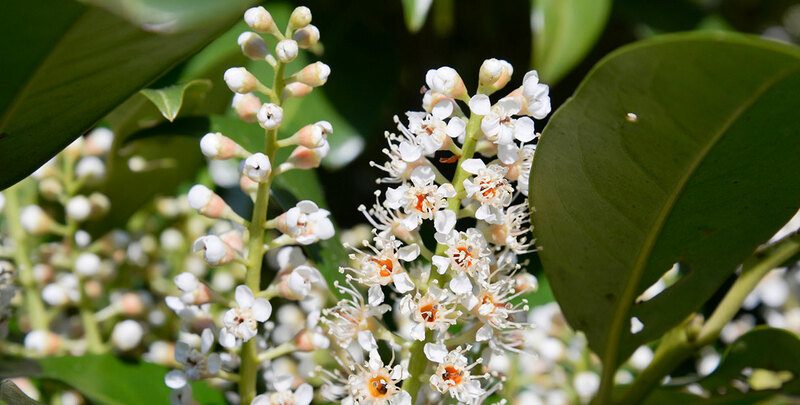 Most cherry laurel varieties have a tendency to grow fairly wide, however, and that is what sets cherry laurel ‘Genolia’® apart from other cultivars. Smaller cultivars like ‘Zabeliana’ and ‘Otto Luyken’ are equally suitable for smaller gardens, but will not grow tall enough to be used as a privacy hedge. Cherry laurel ‘Genolia’® will and is therefore the perfect hedging plant if you are looking for a narrow evergreen screening hedge with a relatively informal character.